Wouldn’t it be nice if you could actually find in-depth information on how to organize files, supplies, and documents so that you can improve productivity? 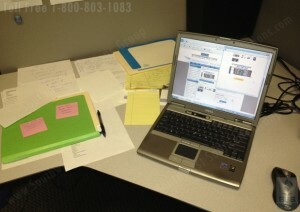 Is your desk stacked with papers you printed, folders with handwritten labels, and post-its stuck all over the place. If you’re looking around at everyone else’s desks, I bet you see the same thing. How does anyone find anything when a client needs a file or a customer asks a question? You shuffle through the papers and folders disregarding the even bigger mess your creating because time matters and once you do find the information, it’s time to get back to work so the mess on your desk just grows. Well you’ve come to the right place because we are here to provide you with tangible solutions that will help organize files on your desk. One simple cost effective way to solve this problem is an Oblique Shelf Organizer with hanging folder compartments. The shelf organizer is great because it can sit in the overhead compartment in your cubicle and will free up space on your desk. You can organize files and folders in the compartments and arrange them in a way that works best for you. The colored labels are easy to recognize and they are magnified so you can actually read the labels. 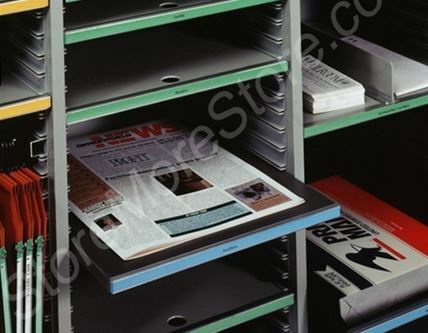 The Oblique Shelf Organizers will also easily fit into any open shelving in your office. 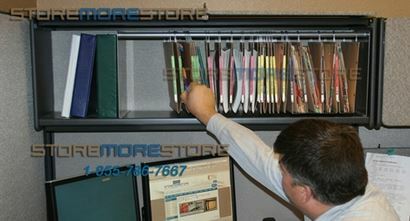 Another way to organize files on your desk is with Hamilton Sorter Desktop Shelves. The sorting trays are adjustable so that you can change the opening heights whenever your file or document storage needs change, and they are transparent, which makes stored documents easy to see. Each tray comes with full length name labels that are easy to read and easy to change. The labels can also be color coded for even easier recognition. Wondering where you can get an Oblique Shelf Organizer or a Hamilton Desktop Shelf, just visit us online at StoreMoreStore to find each of these great products that will organize your desk. And if you need any help or have any questions, give us a call at 1-855-786-7667.